Pictured above is an example of one of the very few occasions when a head-of-state should stand with their feet together. 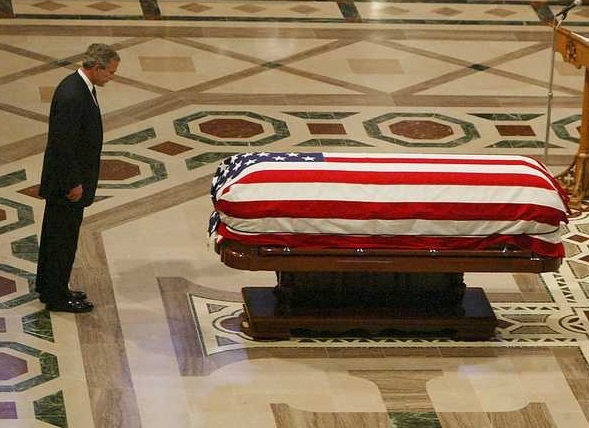 In this image, George W. Bush is seen paying his respects at the funeral of former U.S. President, Ronald Reagan. 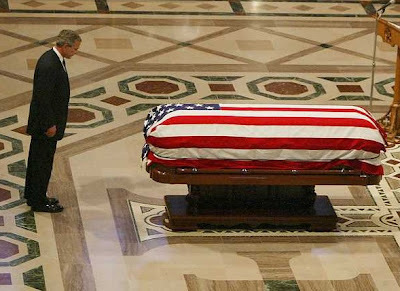 Standing with your feet touching or very close together as Mr. Bush is here, in the vast majority of scenarios is a signal of low confidence and/or low psychological comfort. The other meaning of this nonverbal is the emotion of, and/or desire to demonstrate - respect. This, of course, is why we see President Bush in this stance. When in the company of a superior, e.g. your boss, it's a good idea to show respect. However heads-of-state have no superiors. What remains for these leaders are the following: funerals, weddings, if a former president or prime minister, etc. is in the company of the country's current leader at a public gathering/ceremony,etc., when in the company of a religious leader, attending a religious service, receiving the remains of dead servicemen, visiting a cemetery, during The Pledge of Allegiance (or another country's equivalent), ceremonies at The Tomb of the Unknown Soldier (and similar events), or any other time a high level of respect should be shown. Sometimes it's a delicate balance between showing confidence and being/looking like a leader - and demonstrating respect.